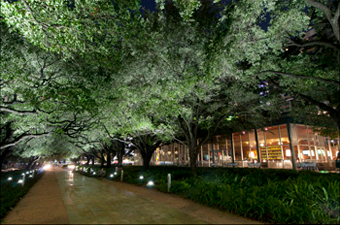 Originally illuminated only by pathway bollards, the park's Board of Directors wished to highlight the Promenade's impressive alley of mature oak trees and entrusted G2LD to design the lighting for the over-600 foot esplanade. 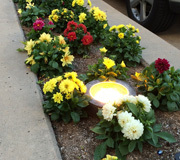 With maintenance and existing ground cover being two concerns for the lighting, our team designed a small custom concrete bollard that would house each LED ingrade fixture. This slight elevation allows the fixture to be level with the existing landscape without being an eyesore or glare source to passing pedestrians. Additionally, significant effort was taken to ensure that the installation process did not harm the roots of the mature trees. 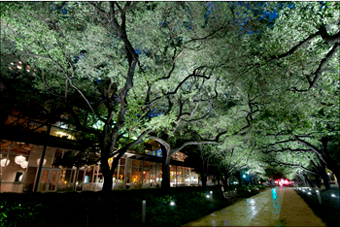 The result is both energy efficient and maintenance friendly while dramatically illuminating one of Houston's most iconic promenades. For more information on this project, please click here. Did You Know? When evaluating lighting for safety purposes, contrast ratio is typically more important than specific light levels. Spikes in light level can cause debilitating glare, while disproportionately dark areas can cause dangerous shadows. The human eye can safely adjust to a wide variety of average light levels, but cannot quickly and safely adjust between high and low levels within the same area. 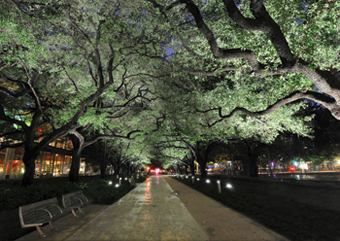 Gandy2 Lighting Design is proud to be a design team member of the Allen Parkway Improvements Project, which seeks to increase beauty, safety and functionality of Allen Parkway between Dunlavy Street and Downtown Houston. Working in conjunction with the City of Houston, the Downtown Redevelopment Authority, Walter P. Moore and SWA Group, G2LD designed the lighting along this important stretch to enhance the four main project goals: improving public safety, improving access to neighborhoods south of the parkway, providing vehicular parking for the adjacent Buffalo Bayou Park, and creating a scenic bayou drive. The addition of new traffic signals, new parking areas, and pedestrian crossings, made it important to readdress the lighting along this roadway. G2LD carefully designed the lighting specifications and layouts in order to meet the most stringent requirements for light levels and uniformity ratios, while minimizing glare to drivers and park users alike. For more information on this project, please click here. It’s a hazard of the job—we can’t go anywhere without analyzing the lighting. We’ve seen it all—the good the bad, the ugly, and the so-bad-it’s-hilarious. So we’ve devised this column to share some of the funniest lighting mishaps. Here's the best guess at what happened here: Early in the design process the design team said 'And outside the building's entrance we'll have some lovely landscaped beds with some specimen trees and crepe myrtles. We'll need lighting in those!' A suitable 9" ingrade was specified to uplight the impressive landscape. Then the budget came back and the crepe myrtles got value engineered down to 'seasonal bedding plants' and that's where the conversation ended. Could have saved even more money by deleting those expensive ingrade fixtures, which are now useless...and pretty silly looking. The lesson here: communication among the design team is key. Even small changes can have a ripple effect on the design. Would you like a copy of our portfolio? Interested in an introductory meeting? 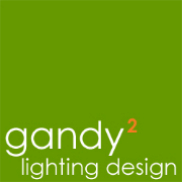 Copyright 2015 Gandy² Lighting Design, All rights reserved.